While I enjoyed living in Ithaca, a small college town for four years during college, I always assumed I would return to live in a large city following graduation and then eventually decamp for the suburbs. And while I did spend three years living in New York City for graduate school, I unexpectedly returned to Ithaca after PT school when my husband got a job at our undergraduate alma mater. Although I never expected to be back in Upstate New York, I've relished living here (again) for the past three years and getting to know the town as an adult. I’ve also realized how great it is to be a new grad PT working in a small town setting, especially after growing up and holding internships in a large metropolitan area with millions of residents in close proximity. With a booming university, nearby hospital, and restaurants galore, I live in a county that is part college town and part farm country. According to the United States Census Bureau, urban areas have over 50,000 people, urban clusters contain between 2,500 and 50,000, and rural areas encompass everywhere else. The census delineates the county in which I live and work as 43.3% rural, with about 210 residents per square mile. Ithaca’s main hubs are the 4,800-acre Cornell University surrounded by Collegetown, a neighborhood densely packed with students crammed into apartment complexes and houses, a downtown cluster of restaurants and stores, and Ithaca College. Drive 10 minutes in any direction, however, and you’ll find yourself surrounded by immense fields and dairy farms. Twice a week, I drive 12 miles east to work in the town neighboring Ithaca, and I often marvel at how few people and how much space lie between the two towns. If you were to drive 12 miles east of my hometown in New Jersey, you would end up in one of the largest cities in the world. The relatively small population means that most people seem to know or know of each other, and that it is hard to stay anonymous. When you mention a road you commute on or a store you’ve visited, you can be sure your conversation partner knows exactly what you’re referring to. On a recent trip to a popular ice cream shop, I counted four former patients in the approximately 20 minutes we were inside. 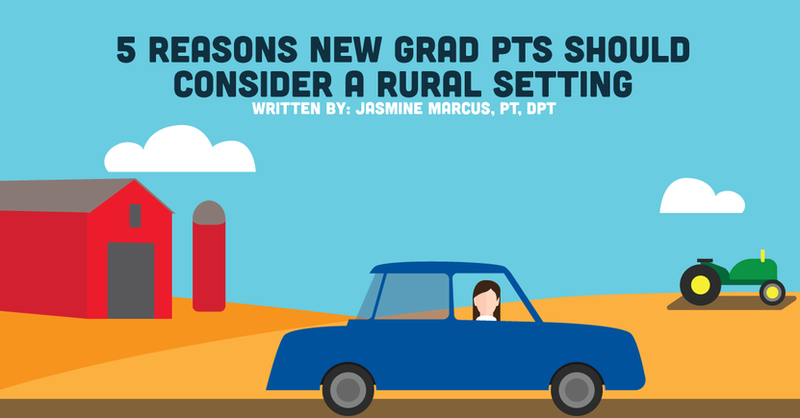 Although working in a small town may not fulfill every new graduate’s fantasy for starting a career, I have found the setting to be a great place to work as a new grad physical therapist. So what makes working in this setting so great? Even before PT school, I knew I wanted to work in outpatient orthopedics. I enjoyed my pediatrics and neuro classes, but didn’t always see how practical those classes would be for my future career. I considered those courses as subjects that would one day appear on the Boards. However, in the county where I practice, there are no pediatric or neuro physical therapy clinics. This means I treat seven-year-olds with ankle sprains and 70-year-olds post-CVA. I have to be ready to treat almost anyone who comes in and falls within my scope of practice, since there often isn’t anyone more specialized around. This has kept me current on a lot more of what I learned in school than I ever expected. You treat all types of patients. Having a smaller patient population also means my clinic sees patient populations many practices in larger areas decline treating. My company takes almost all local insurance types, including Medicaid, worker’s compensation, and automobile accident cases. Not only do I feel good about being able to provide quality care to these typically underserved communities, but I also gain the uncommon experience of working with these patients. Contrary to a commonly held stereotype, I have found that most people on worker’s compensation are eager to return to work, and it is a unique challenge helping these patients meet their goals. The small town vibe means I’m often only a degree or two separated from most of my patients. In the clinic, I’ve met former professors and administrators who helped me with everything from completing my college major to obtaining the mortgage on my house. This shared thread often leads to a closer therapeutic alliance and makes conversation flow more easily. Often, I know exactly where a patient hangs out or works, and can adjust our treatment to fit their lifestyle. For example, I know exactly which hike they plan on taking or which campus building is difficult to navigate on their way to work. The size of this area also leads to something that can be a double-edged sword: frequently bumping into patients outside of work. Although it may make me think twice about dashing out of the house in ugly sweatpants, I enjoy running into former patients and catching up. Sometimes this leads to finding out what happened to the patient after they left my care. I get to discover the long-term results of my treatments in a way few PTs would otherwise find out. Whether it’s the high school student returning to soccer or the adult back to long hikes, it’s great to get feedback on how my treatments held up long term. You'll play a larger role in medical management. Most patients in the area tend to wind up at the same few medical practices, allowing my coworkers and me to develop relationships with many local physicians. This can mean knowing which primary care physicians to trust when they diagnose a patient with “lateral epicondylitis” and which are most likely to send us mutual patients with “elbow pain.” It also means knowing which orthopedists tend to prefer which post-operative protocols, and how to prepare patients best for their follow-ups. Conversely, due to the relative lack of primary care physicians in the area, it is even more crucial that we have the time and skill set to dedicate to solving patients’ musculoskeletal complaints. We are able to effectively help many of these patients without increasing the burden of care on their PCPs. So while living in a rural area isn’t what I necessarily imagined for my first job, it is a great place to be a PT, especially a new one!